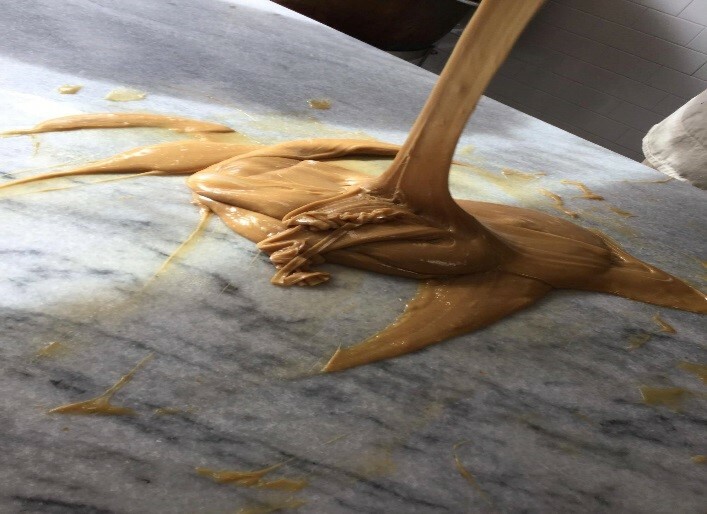 We've all heard the saying, "good things come to those who wait"; For us, we've never found the virtue of patience to be more valuable than when we had the opportunity to watch the chefs of Kilwins create their decadent peanut butter fudge. We learned all about how this carefully crafted dessert snack is not only made with homemade and exclusive ingredients, but also with a little patience and a whole lot of love! 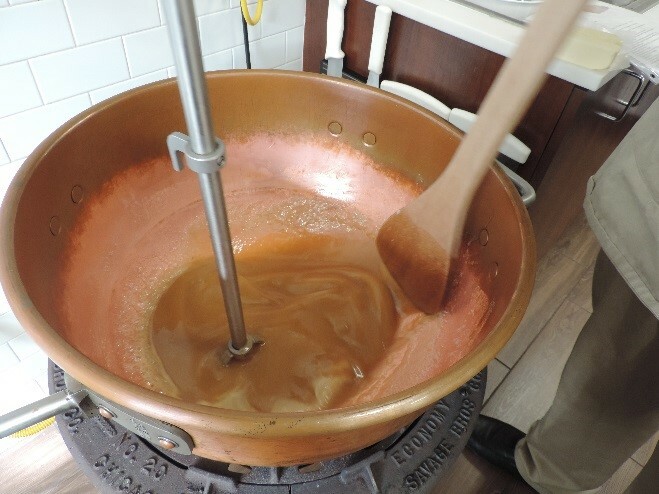 It all begins with batching together the dry ingredients and whisking them with water and heat in a huge copper kettle! (This picture doesn't do it justice; but the kettle is huge!) This process took some time as Chef Dionne stirred, stirred and stirred some more until the ingredients were completely dissolved! What's key at this point is using the proper temperature control to prevent the fudge from sugaring before adding the butter. 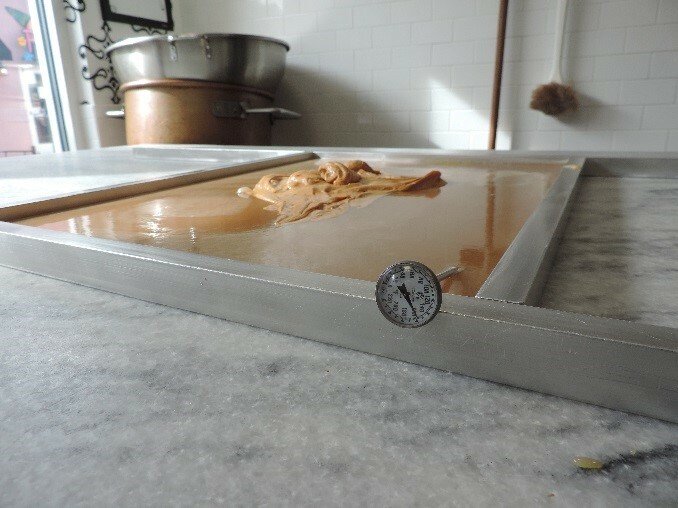 For some of us that aren't wise to the kitchen lingo, sugaring is when the ingredients aren't fully dissolved which can make the fudge grainier. However, that is not the case at Kilwins, as Chef Dionne is always on top of his game! Next up, comes the transferring of the mixture and pouring between metal bars onto the marble table before topping it off with Kilwins' own peanut butter. This not only takes precision, but some muscle! It also took some will power on our end not to steal a spoon from the kitchen and dig in right there; yummy! Now, here's the part where patience is a virtue as the fudge cools to a sweet 100 degrees. A process that takes approximately ten minutes, but they were the best ten smelling minutes of our lives as the scent of fresh fudge swiftly filled the whole shop. 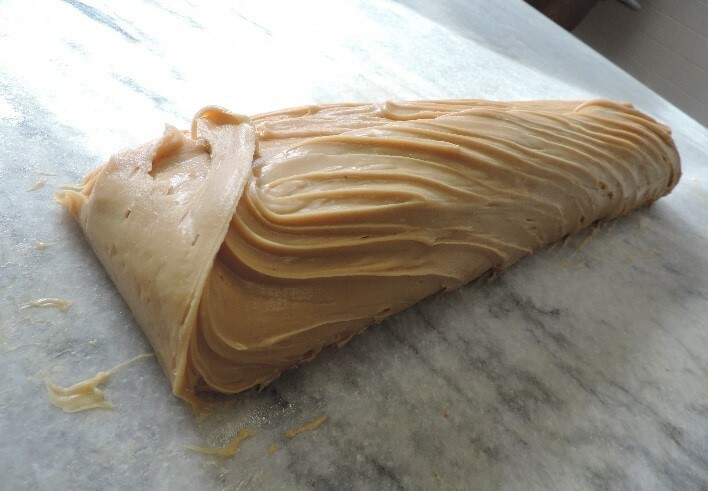 Since we were not able to dig into the peanut butter fudge just yet and patience really isn't our strong suit; we took the opportunity to sample Kilwins peanut butter ice cream. It helped us get through the waiting process and was absolutely incredible! 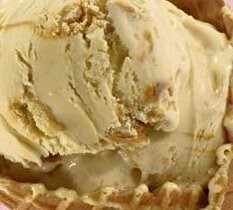 By the way, the extensive variety and unique flavors of ice cream and sorbets at Kilwins deserve a blog for themselves, can you say mmm, mmm good? Now let's get back to the fudge! Once cooled, the metal bars were removed and that's when the real show of fudge forming began and we found ourselves mesmerized with the careful, yet crafty way of rolling this snack into perfection. Once again, the picture doesn't do it justice… click here to see the swift paddling moves of Chef Dionne. We watched in amazement as the thick cascading liquid of fudge was slowly loafed into this beautifully formed sweet dessert. 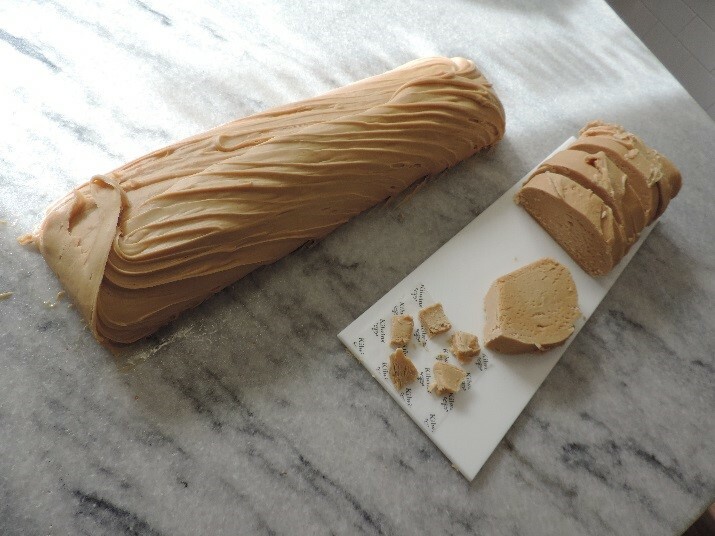 Interesting Fudge Fact: to determine when to switch from paddling to loafing, look for the fudge to begin to lose its shiny appearance, taking on a dull sheen. It will also run more slowly; almost coming to a complete stop. Now the moment of tasty truth. Once we were given the official, "okay, the making of the fudge is now complete." We immediately put out our hand for a free sample and let's just say, it was absolutely worth the wait and will be worth a weekly, okay maybe daily, stop into Kilwins Myrtle Beach at Broadway at the Beach. It's the undeniable smell when you walk into any movie theatre, it's the sound of kernels popping that leads to the first taste of happiness, it's the variety or sweet, savory and everything in between, it's delicious, it's delightful… it's National Popcorn Day! From grabbing a bag to enjoy while watching a show at Legends in Concert to snacking on the sweetness of Carmel corn from River Street Sweets, you can enjoy your favorite popcorn flavors all day and night at Broadway at the Beach. Before we dig into the delight, let's take a look back with a "pop" of history. A quick Google search tells us the first "pop" did not appear in the United States until the 1820s. As the snack grew in popularity, so did the variety in which it can be enjoyed including Louis Ruckheim's creation of Cracker Jack, made from popcorn, peanuts and molasses during the late 1890s. Fast forward to today, the flavorful fumes of popcorn can be experienced all throughout Broadway at the Beach. In the warmer months, popcorn can be found at every corner with kiosks offering everything from candy corn to caramel corn to cheddar corn and more popcorn creations. It's a great snack to enjoy while strolling from store to store while you enjoy fireworks and other events at Broadway at the Beach. Don't forget, many offer free samples! Need a gift idea? Who doesn't love a sweet popcorn present from River Street Sweets, Wee R Sweetz and even the unique favors offered at the Beef Jerky Store including Maple Bacon. Yes, we said Maple Bacon flavored popcorn… yum! So if you're in the mood for a pop of flavor for walking around, while catching a show or to give as a gift. Come smell, snack and treat yourself this National Popcorn Day on January 19th at Broadway at the Beach! When you think of Myrtle Beach, often the first thing that comes to mind is the hot sands and waves crashing on the coast in the heat of the summer. From the distinct smell of sunscreen hitting your nose to the sound of steps made with flip flops on your feet, the summer sizzle of South Carolina's Grand Strand is one of the highlights of the year for millions of Myrtle Beach visitors. But let's face it, even at the beach, the temperatures do sometimes fall and the number of clothing layers rise. When this happens some tend to stay indoors and socially hibernate until the warmer temps return, but we are here to tell you Broadway at the Beach can help you keep the cold and winter woes away with our fantastic fashion finds, fun and amazing food . Let's start with some non-frozen fashion, whether you're looking for a stylish ensemble or a piece of statement jewelry, Broadway at the Beach's retail shops have you covered. If jewelry is what you need to add some fab to your winter drab, then check out Bijuju for a variety of stylish necklaces, bracelets, earrings, purses and they even carry beautiful luggage suitable for any tropical destination! If you're looking for something a little more specific, such as sterling silver head on over to A Silver Shack, Pandora look no further than The Mole Hole or for Alex and Ani our friends at Gemini Boutique have your style! Want some snuggly and warm clothing for cuddling up on the couch or for when you're out and about? Victoria's Secret Pink Collection and Collegiate Collection will not only keep you warm, but comfortable too! From pull overs, leggings, active wear and sleepwear, Victoria's Secret at Broadway at the Beach gives you great style that is sure to warm up any winter night! Moving on to one of our favorite subjects, FOOD! There is nothing like warming yourself up with a big bowl of hot soup or adding some spice to your regular culinary routine and you can easily kick up the deliciousness at Broadway at the Beach! Wahlburgers' Homemade Chili has just the right amount of heat and flavor for a nice meal to enjoy in their new location in Celebrity Square or on the go; and if you're tastes buds desire a little more coastal cuisine to beat the chill, try the seafood Gumbos and clam chowders at Landry's Seafood and Joe's Crab Shack! So we've got fashion, we've got food… now let's talk some fun! Don't let the sometimes chilly temperatures spoil your day, enjoy the indoor attractions of Ripley's Aquarium and WonderWorks. From exploring the depths of the oceans to the heights of space, you can enjoy a day of learning, interacting and exploring the world without having to bundle up, fly out or ship out! With fashion finds, hot dishes and indoor amusements, here's to your next winter warmup courtesy of your favorite stops at Broadway at the Beach! What station is your car radio tuned to? It's safe to say if you were to ask these three simple questions to 100 people, you would easily receive 100 different responses. Some may be more partial to a country twang or a riveting rock rift, while others may want a rhythm to move their feet to. Whether they prefer the soothing, smoky sound of the blues, powerful gospel ballads or rocking out with their air guitar, there is one LEGEND that is likely to have influenced them all. A musical icon, he was one of the first to transcend genres, show off signature moves and introduce us to a little something called Rock and Roll. If you haven't already guessed it, we're talking about the man, the legend… the King, Elvis Presley. Now, forty years after his death and in honor of what would have been Presley's 82nd birthday, Legends in Concert invites you to take a trip through his iconic career and life with ELVIS LIVES, "THE ULTIMATE ELVIS TRIBUTE ARTIST EVENT." The sixth annual ELVIS LIVES tour returns to Myrtle Beach from Graceland for the kick off of its 2017 touring season. Beginning Friday, January 6th, the three day ELVIS LIVES event is a journey across Elvis' life featuring winners and finalists from the Elvis Presley Enterprise annual worldwide Ultimate Elvis Tribute Artist Contest, each representing Elvis during his four eras: the 1950s, 1960s, his movie career and concert years. It's a show for Elvis fans of yesteryear and today as it gives us a glimpse of how one man changed the face, dance moves and the sounds of music forever. As you plan the first official weekend of 2017, why not add a little nostalgia to your night out, or just join your fellow Elvis groupies and have a night you'll never want to forget! So if you ain't nothing' but a hound dog and are a little lonesome tonight but you can't help falling in love, don't head to the heartbreak hotel, but instead grab your blue suede shoes, get all shook up and enjoy a night where Elvis Lives once again at Legends in Concert at Broadway at the Beach.